Compelling design with high standards of usability and accessibility. Facilities for video, sound and a range of special features. Material can be sourced from remote repositories through OAI or Z39.50. System Simulation has created a series of pioneering web sites and portals for institutions in the cultural sector and in Higher Education (see case studies). Built on sound technology, we have permitted the presentation of striking content, with fluidity of navigation and high standards of accessibility. We have also proved to be highly flexible, as requirements have evolved and have consequently allowed these institutions to achieve a significant web presence. Similar technology is delivering very successful kiosk and flat-screen systems, print and electronic publishing and output to mobile devices. 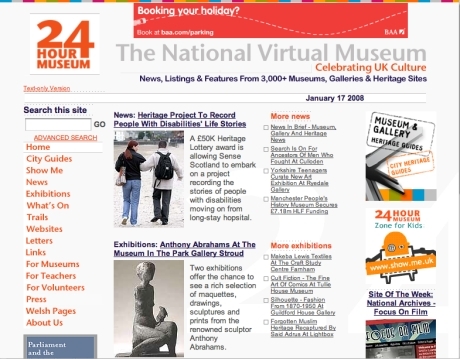 (See Kiosks, Mobile Devices and Digital Galleries ). Our web sites have generally been database-driven and increasingly have been built on our Content Management System, ContentIndex+. ContentIndex+ manages workflow, promotes consistency and coherence, allows multiple use of information content and can publish to multiple sites and/or other media. System Simulation's wide experience allows it to adopt a highly flexible approach to the building of web sites. Our in-house design team provides our distinctive Design Services directly, but equally this in-house capability often allows us to work successfully with clients' own designs or with those of third parties. In all cases, a disciplined approach to design issues helps clients to move efficiently from concept to effective realisation. The sites themselves range from simple, static HTML implementations to dynamic, database-driven systems that can access remote data sources, using Z39.50, SRW/U or OAI protocols, provide RSS feeds and podcast downloads and make use of a series of specialised features. Frequently they are built making use of our content management system, ContentIndex+ . ContentIndex+ is a Content Management System developed with a real concern for content management. It handles a variety of digital assets (text, images, multimedia ) and envisages publication not only to web sites, but to a variety of media, delivering consistency of presentation and style through flexible template structures and Cascading Style Sheets. In doing so, it draws on System Simulation's extensive experience of complex data management. ContentIndex+ has huge capacity, provides for multiple-access, has professional cataloguing and terminology features, powerful, structured search capabilities, management tools to support efficient work processes and flexible access and delivery systems. Specialised features include provision for audio and video sequences, slide shows, image panning, zooming and several timeline and map-based facilities. A feature known as 'Storyteller' provides a simple and direct way for users to submit their own stories, complete with images, while webform facilities allow other types of data to be submitted on-line. WSRP Embedding technology adds a whole new dimension to web sites, allowing web services to be incorporated into other sites or web-based content to be implanted in other applications. Our longstanding experience also means that high standards of usability and accessibility are built into our web systems. Usability testing can be arranged either directly or through independent third party organisations. Hosting can be provided directly or through third parties and advice can also be provided on such issues as increasing the impact of web sites.